I have always loved a good fairytale. Many excerpts from The Chronicles of Narnia or The Princess and the Goblin can still give me goose bumps. However, there is something really inspiring about true stories. Hearing the tale of a person who walked on the same planet I do and found the strength to do something heroic or unique, gives me courage for the story I’m living. Over the years, I’ve happened upon some really amazing stories captured in illustrated books. Some of them are old favorites I read as a kid, others I enjoyed just this year. All of them tell a true story of one person, who did something extraordinary! Fair warning: I couldn’t help but include several author biographies. 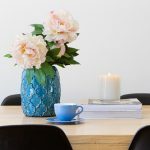 As a writer, I’m always drawn toward stories which take me “behind the scenes” of my favorite books. This, however, is one of the best! 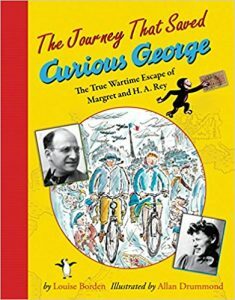 With seventy pages of engaging illustrations and fascinating insights, The Journey that Saved Curious George begins in Germany long before Hans Augusto Reyersbach grew up, fell in love, got married, wrote stories about a curious monkey and took a perilous journey to seek refuge from the Nazis. With little more than his manuscripts and artwork tucked inside his winter coat. Hans later took on the pseudonym H. A. Rey as a way of disguising his un-welcomed German name. This really is a great, stand-alone story, but is especially wonderful for lifelong fans of Curious George, such as myself! I remember my mother reading this book aloud to my brother and sisters and I when we were being homeschooled. 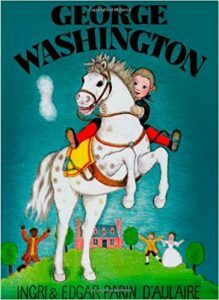 I even used my Barbie dolls to put on a “play” based on the life of Washington after I heard the story. The play was actually a bit of a flop, but the book is still a winner! 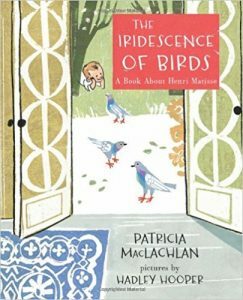 The D’Aulaire’s, a married author/illustrator team, created many truly timeless books. I love the illustrations and the large format—perfect for reading aloud. This one begins in the wilderness of Virginia, before Washington was born in the little red house on an oyster shell hill. It finishes with a bang, as he assumes his role as father of our great nation. Other wonderful biographies by these authors include Pocahantas, Benjamin Franklin, Columbus and Buffalo Bill. 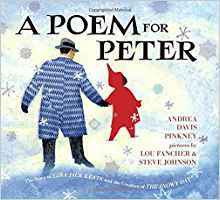 Just published in 2016, A Poem for Peter tells a moving tale which couldn’t be a timelier reminder. Andrea Davis Pinkney grew up in the 1960’s. “I didn’t see others like me in children’s’ books” writes the African American author. “I was profoundly affected by the expressiveness of Keat’s illustrations.” Who is this Keat? I’m so glad you asked. Jacob Ezra Katz was born in 1916 after his family fled Warsaw and settled in Brooklyn. They hoped their Jewish heritage would be more warmly accepted in America, but life was still very difficult, even in this “land of the free.” Jacob, or “Jack” as he was called, became an artist and an advertising man despite these setbacks. What he’s most famous for, however, is shocking the world when he included African American characters in his illustrations. Characters such as Peter, the main character in the award winning picture book, The Snowy Day. 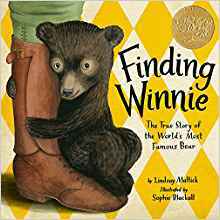 I’ll let Pinkney, and the excellent illustrators Lou Fancher and Steve Johnson tell you the rest, as they do so very well, but know that this book will go down as one of my best loved. This is a fun one for many reasons! It’s a book about one of my favorite artists, Claude Monet and it is also an original story about a curious little girl named Linnea. 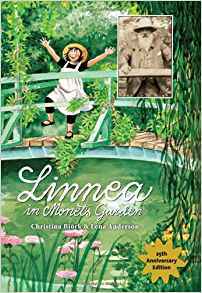 Linnea in Monet’s Garden is a longer picture book that follows Linnea and her friend Mr. Bloom to Paris to see the famous garden and bridge from Monet’s artwork. It would be a charming story on it’s own, but it is also a top-notch bio’ of one of the best known painters of all time. Learn about Monet, paints, impressionism, botany, museums and-oh yes-Linnea in this delightful book. Gorgeous illustrations by Lina Anderson are accompanied by prints of Monet’s work (I love the close-up shots of his thick swaths of paint) and photographs of the artist, his family and home. Winnie goes on to become the mascot of the Second Canadian Infantry Brigade and have many adventures with Harry, but one day, Harry has to face the fact the he cannot raise this bear singlehandedly. So Winnie goes to live in the zoo in London—and that’s really where the story begins. It’s at this zoo that a man named Alan Alexander Milne and his young son, Christopher Robin, first meet Winnie. Christopher Robin’s imagination and his father’s knack for writing mean the rest is history. This might be my favorite book I’ve read this year. Technically a picture book, but long and informative like a chapter book, Some Writer! is exquisitely told and illustrated by Melissa Sweet. Elwyn Brooks White was born in 1899 in New York City. His family called him “En.” We call him E. B. White, a monumental figure in the realm of modern literature. 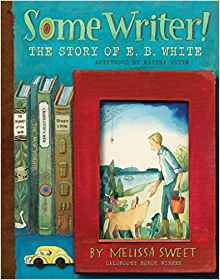 Long before penning Stuart Little, The Trumpet of the Swan, Charlotte’s Web or The Elements of Style, White knew he wanted to be a writer. He said he was seven or eight when he first looked a blank page “square in the eye” and thought, “this is where I belong.” I really cannot say enough about the quality and presentation of this book. I gained so much from it, as an adult. I know I would’ve eaten it up as an eleven-or-twelve-year old, had it been written back then. Every writer, artist and naturalist should pick up a copy. Everyone else should borrow one from a friend. Okay, this one was right up my alley! Alcott is a personal heroine of mine. As a matter of fact, my shelves boast at least five books about the famous authoress and her works. 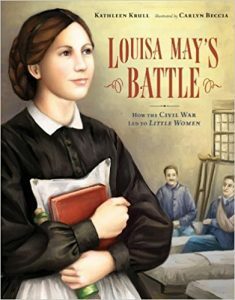 Louisa May’s Battle is unique by way of focusing on her time as a nurse during the American Civil War. I loved to “zoom in” on this oft-forgotten aspect of Alcott’s life. She was a courageous nurse in a time when most medical professionals were men. As a matter of fact, female nurses were greatly discouraged, being required to be “at least thirty, very plain, unmarried, strong, with two letters about her good character.” Louisa May was determined to be qualified and did everything she could to relieve the pain of the war she so hated. It is really fascinating how these experiences led her to write the books we so adore, such as Little Women and Eight Cousins. This is another book that focuses on a small segment of someone’s life. 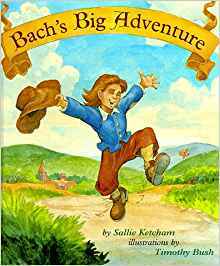 Bach’s Big Adventure was influential for me as a child because it brought the mysterious composer to life in my mind. Through vivacious, watercolor illustrations by Timothy Bush, we see young Johann go on an adventure so big; it changes the trajectory of his life. As a matter of fact, it arguably changes the trajectory of the world, or at least the world of music, forever. When an angry cook throws a pair of fish heads out the window and hits Johann in the head (yes—it’s a pretty hilarious tale!) Johann is so hungry (and poor) he decides to eat them. When two coins fall out of the heads, he immediately uses this “Godsend” as fare to Hamburg, where he’s determined to hear Adam Reincken, the best organist in the world. A funny, spunky, inspiring read! They give us inspiration, courage and ideas. They help us to learn from history, from the mistakes and wisdom of others and to realize the power of determination. What real life story has inspired your family? Share your favorite biography in the comments! Caroline Rose Kraft started blogging as a teen in 2007 as an outlet for her wonderful but crazy life. 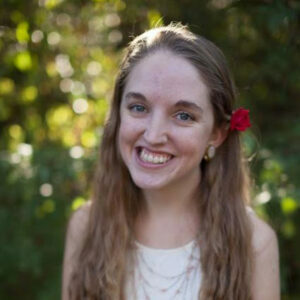 She’s a homeschool grad, sister to eight, passionate advocate for educated adoption and author and illustrator of Always Plenty. She blogs at carolinerosekraft.com and also gladly contributes to kindredgrace.com on a regular basis. Caroline lives at a place called Eyrie Park in Central Texas. Love this list. Want to add “Carnation, Lily, Lily, Rose” by Hugh Brewster with illustrations by John Singer Sargent.